It's not the prettiest of plants. It looks somewhat like a thistle. No matter. The honey bees love it. 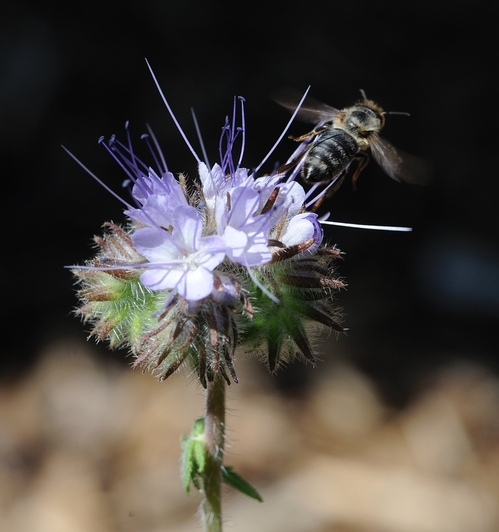 Lacy phacelia (Phacelia tanacetifolia), a leggy three-foot plant with clusters of light blue to purple flowers, attracts not only honey bees but syrphid flies, bumbles bees and other pollinators. 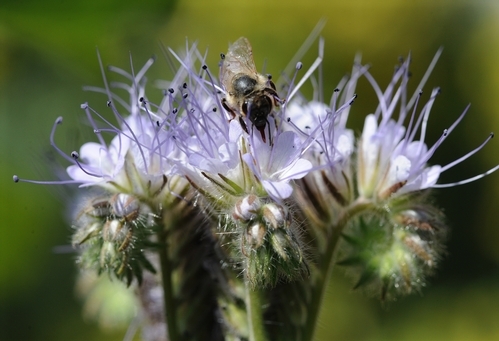 Some folks call it "the honey plant" because it's considered one of the top 20 honey-producing flowers. Native to the southwestern United States and northern Mexico, it's an annual that's used as a cover crop and as bee forage. It's especially popular in Europe and in California vineyards. The Xerces Society recommends that it be planted in the almond orchards to attract pollinators after the almonds finish blooming. 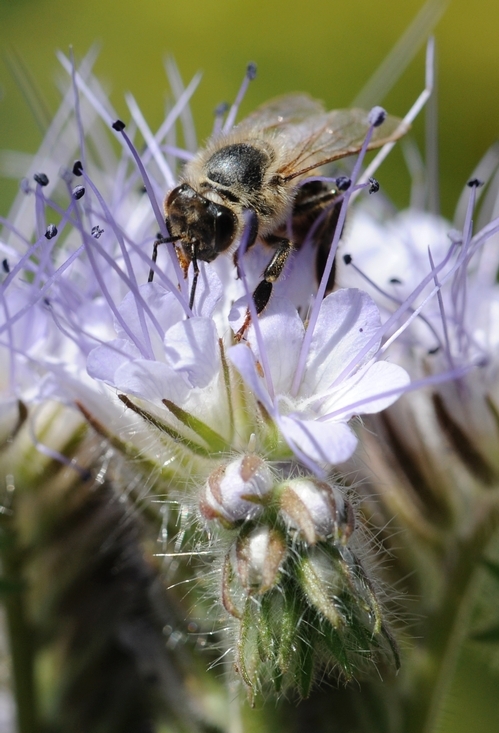 The Xerces Society recommends that it be planted along access roads and roadways as a nesting habitat and source of nectar and pollen for early emerging bees. We planted some in our bee friendly garden to see what it would attract. Last Sunday one of the first insects it drew was an aged honey bee, her thorax worn of hair and her wings ragged. The slow-moving bee foraged among the delicate blossoms. Indeed, the soft breeze moved faster than she did. Then, lift off and she was gone.